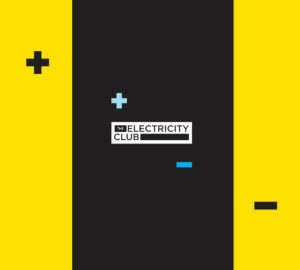 VILE ELECTRODES played The Electricity Club’s inaugural live event TEC001 in 2011 and will return to the fold for TEC003 at Hertford Corn Exchange on SATURDAY 13TH SEPTEMBER 2014. The date is significant in the Vile Calendar as it is the first anniversary of their debut album ‘The future through a lens’. For that reason, VILE ELECTRODES will be playing the entire album live for the first time at TEC003. Having completed a tour of Germany supporting OMD in May 2013 after being spotted by Andy McCluskey while he was perusing The Electricity Club, VILE ELECTRODES gone on to win two prestigious Schallwalle Awards for Best International Act and Best International Album and been able to strike out three sections of their ex-KRAFTWERK member bingo card having met KARL BARTOS, WOLFGANG FLÜR and MICHAEL ROTHER! 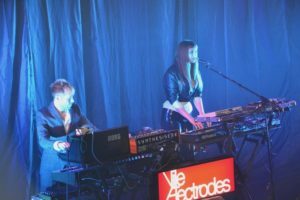 With front woman Anais Neon’s striking effervescent presence, the other key to VILE ELECTRODES’ success and acclaim has been synth wizard Martin Swan. 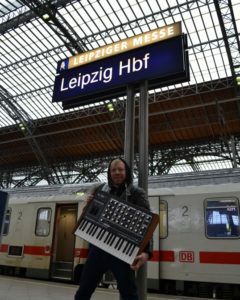 His first synths were the Casio PT20 and Roland SH101 while other items in his vast collection of electronic equipment now also include a Roland Juno 6 and a Korg MS20 among many. However, Swan does not wallow in vintage synth nostalgia so more recent additions to his armoury have included the Analogue Solutions Leipzig, a Dave Smith Evolver and an Anyware Tinysizer Mini Analog Modular System. So much has happened since the tour of Germany and the release of ‘The future through a lens’. Has there been a particular highlight for you? Of course, playing with JOHN FOXX straight after the OMD tour, and our returns to Germany, including playing with MICHAEL ROTHER have been pretty special, and obviously winning the Schallwelle Awards – we really didn’t expect to win anything at all and were just there to see friends and have a party so that was amazing. Being asked to perform as part of the celebration of THE RADIOPHONIC WORKSHOP was also very exciting, and hearing your music played on national radio? We just feel very privileged that there are some people who like our music, so every bit of merch we sell, or every gig goer who makes a nice comment is a highlight really. If we can talk remixes for a moment. Is it more flattering to be asked to remix someone else’s track or to have someone remix a Vile song? Well in a way, having someone ask you to remix their material is very flattering, as it makes me think that they value my musical and production skills. Of course it’s always nice to have people you respect and admire ask to do remixes, but I always have a pang of doubt that it’s because they think my production on the original isn’t that good! In reality, they wouldn’t ask if they didn’t love the song though, so I know that’s nonsense! Some mixes are substantially different to the original. Are you influenced or inspired by certain artists that are known for their remixes? When I listen to remixes, I really don’t want to hear the melody of the original laid over a dancey beat. I think that is one of the most pointless things in music really – it’s just lazy. I’m not saying there aren’t cracking dance remixes of great songs, but so few mixes like that actually add anything to the original. The remixes I love usually take the song in a completely different direction, and often change its context. We like to approach the remixes we do as sort of conceptual works – we take an idea about what the song, or the band means to us and build something around that. When OMD asked us to remix ‘Night Café’, we thought about the idea of it appearing as a ‘B-side’, and thought about all the amazing OMD B-sides that we love, sometimes more than the A-side! And we wanted to do something with the remix that suggested some of those songs – ‘Navigation’, ‘Annex’, ‘4-Neu’, ‘The Avenue’ etc. 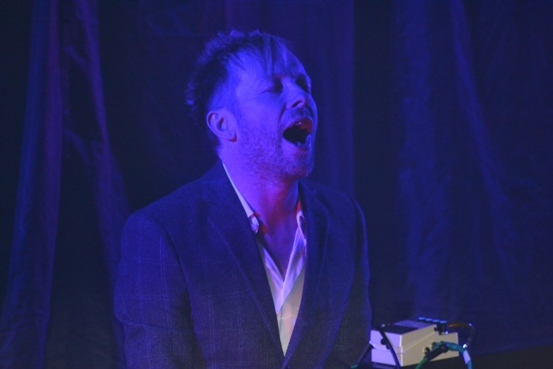 So the remix became a kind of homage to those tracks, whilst also acknowledging the darkness in the lyrics of the song – which lots of people seem to miss. I couldn’t say there’s anyone who I particularly admire for their remixes. It’s more when a specific track captures my imagination. Jimmy Cauty’s reworking of PLACEBO’s ‘Every You Every Me’ – which is called the ‘Infected By The Scourge Of The Earth’ remix is a good example. It takes a great song, makes it sound totally insane, but still manages to keep the spirit of the original. More ‘traditionally’, I’ve always liked FELIX DA HOUSECAT and DJ HELL for their dance remixes for some of the finest Electroclash bands – LADYTRON, FISCHERSPOONER etc and of course from back in the day, those great Stephen Hague and Arthur Baker 12 inch mixes of the PET SHOP BOYS and NEW ORDER. Would it fair to ask if you have a favourite from all the remixes? 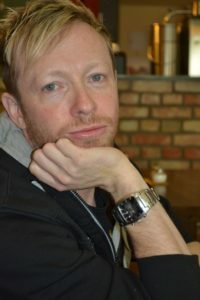 Being a devotee of synths and a composer of electronic music, how important is it to hold workshops and for you get involved in projects such as those at The Science Museum? Well it’s very flattering that people think I’ve got something valuable to contribute. I think it’s really more that I’m kind of interested in everything, so I like the cultural and social aspects of helping people to explore something I’m very passionate about, as much as the nerdy aspects of it. I’m certainly not an expert though, more just a highly opinionated enthusiast! I teach music production for a living, so I guess it’s an extension of that really. Coming back to your debut album, ‘The future through a lens’ – have the interludes between tracks been developed further? Can we expect a follow up album sometime soon?